Product Showcase: Copic Markers & a Giveaway!! Copics. Raise your hand if you have been dying to get your hands on these. Oooh oooh! Me Me Me! (Me frantically waving my hand.) I recently acquired these amazing pens for the purpose of this review. They are everything that I had hoped them to be. FABULOUS. Let me tell you why. These pens are great because you can blend them and not tear up your paper. The idea of blending is that you want to saturate your paper with the lighter color first, then go over it with the darker shade with an equal saturation. After this, then go over with the lighter color again to get rid of the harsh edges. Another thing I really liked is when blending two colors, the lighter color does not become discolored. HUGE bonus. My whole opinion is that these markers are great. The only drawback is the price, but you get what you pay for. I, personally, will continue to build my collection of these markers. What do you think? Do you have Copics? Are they on your wish list? Let us know! Leave your comment here by noon EST on Thursday and be entered to win a prize from COPIC! I have heard so many wonderful things about these markers. They are definitely on my wish list! I really enjoy using copic markers. While they are on the spendy side, I totally agree that you get what you pay for. 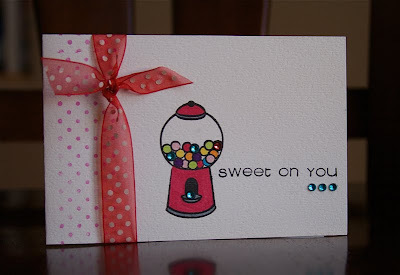 Now that I have a few I find that I am using my stamp collection much more because it is so much fun to color them in! Something I love about them is that you can get that shaded look with just one marker if you keep going over the areas you want darker. Fun product for sure! I have never used them, but would love to give it a try! I don't have any but I have heard great things about them. These makers have been on my want list for a long time. I've never had a chance to try them and after having purchased so many markers over they years that didn't measure up I'm a bit gun shy. I would love to try them and if they are all they claim to be I'd have no problem with the price. I might have to build my collection slowly but from what I understand they basically last forever because they can be refilled. I also heard you can even mix your own colors. That is VERY appealing to me because sometimes the color I want doesn't exist pre-made. I have tried these markers once, they are great. I do not own any, so if I win, that would be awesome. Thanks for a chance to win. I don't have copics (yet) but I would love to have some. Cute cards! Thanks for the giveaway! I have not tried copics, but would really like to. The price is a definite drawback and the reason I haven't purchased any. I would love to have a set of copic markers!! I have not had an opportunity to work with them yet, but have several friends that have, and they just rant and rave how great they are! You are absolutely right, they are a bit pricey, but I have always believed that you get what you pay for!! I have never heard a bad thing about them. I don't have any...yet. But I've seen so many great reviews about them lately, that I think they are my next major purchase! i've never used copics before! i would love to have them, but my budget just will not allow!! thanks for the chance to win! I have never used copic before, I have seen sooooo many wonderful projects produced by these wonderful markers. With this wonderfuk review, it has enticed me more to want them.. I love you projects, the blending is what drwas me in and the fact that your paper is not torn after using these markers over and over in one area is a plus!! Thanks for a chance to win!! Love your reviews!! So far, I purchased 3 browns to get started, E55, E57, E59, because I wanted to start with something basic. I used them to color the edges of Prima flowers for added dimension and the worked beautifully. They are all they are hyped up to be because they blend well, dry well and have deep tone. i would love to try copics!!! thus far i have been much to cheap (poor/broke/bad with money) to buy any!!!!!!!!! great review, thanks! i covet the copics, but alas, my wallet cringes at the price tag. i would be incredibly lucky (and grateful) to acquire some. I have not tried them yet.. but I am really starting to see them EVERYWHERE. You scrapbookers are enablers! I haven´t used these markers yet but I´m really looking foward!!! All the work that I see with the copic markers get me stunned!! The collors are amazing!! Super cool and definitely on my wishlist!!! Thanks for the review! Love your cards Ashley! I haven't tried Copics...yet. I have seen so many creations and fabulous coloring with these, and only wish I could be half as good as the artists out in the blog world. Thanks for the chance! I have a few Copics. I couldn't figure out what the big deal was...they are just markers. Ok, I realize now that I need to do some research and find out more because your "tip" on how to blend with them was news to me. I have a feeling I may just find out why they are "more than just regular markers". Thanks for another great review (and inspiration). I've never tried copics and am dying to do so. Thanks for the chance to win! I've never used Copics but hey, this would be a good time to start! copic markers. What a great blog prize. I would love to try these markers out! I have a few copics and love them!! I am currently saving up to try and get more of the colors. I love Copic markers. What hooked me is the fact that I now like my coloring. Thanks for the opportunity to win a Copic prize!!! Oh my best product enabling scrap friend has been raving about these markers- hoping to find some close to home that I can try. 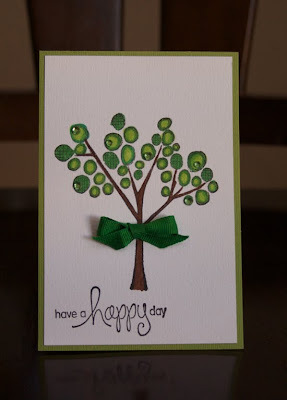 Love your tree card- you can really see how the colors blend! Wow! Your card examples are incredible! I LOVE Copic markers! I have a few and love their blending and shading capabilities and the fact that they go on so smooth, do not tear your paper and that you can use them on so may surfaces (including fabric)! I would love to add to my collection! Thanks for the chance to win such a great givewaway! I have heard such great things about them and really want to try them. I would love to play with a couple before I bought them, but seeing as none of my friends nearby have them, I will probably end up buying one and testing it out! I just bought my very first Copics on Saturday. Only used them a little, but I see great potential once I watch some videos and see all the awesome things they can do. The price has prevented me from trying these. I have some good quality markers, PrismaColors, and I love those, but I can't help but see that the quality that comes from Copics seems to be unmatched! No, I don't have any but I did finally try this this past weekend at a retreat this weekend and they are great! I would really like to try these markers. I see them all over the blogs, but I have been unable to get any here in town. Thanks for the chance to win some!! i've always wanted to try them! I've never had the chance to try one, but everything I've heard about them has been good. I like your examples of what you can do with them! I have never used them but they have been on my wish list and would love to win some to start my collection! Personally, I don't have any Copic markers. They are on my wish list! They could certainly spice up the idea of using my stamps...so I think trying them would be on my wish list and winning them would be sweet! Thanks! I don't have any copics yet...but would love to try them! I've slowly started to build a collection of Copics. My Hobby Lobby sells them and sometimes you can get them 30 or 40% off. Could you guys do a review of their Spica glitter markers--havent used those yet. Copics are definitely on my wishlist. I think they are fabulous! I think they are an amazing tool. I have to say that I am still using my watercolor markers and I'm not sure that my extended family knows the difference. Someday I hope to get a chance to try out the Copics so I can see the difference. Thanks so much! Ohhhh...these would be so much fun to play with..love what you did with your cards. Thanks for this opportunity. I have a small stash of Copics. It took me a while to get how to use them, but I love them now. Slowing growing my stash. I haven't tried Copics yet but they are on my wishlist for my birthday in April! It seems everyone is using them for their coloring and the projects all look so great. I can't wait to try them! I have really wanted to try these but can't get past the price. Thanks for the fabulous review and chance to win! I am dieing to try Copics and love all the projects I've seen with them. These cards are adorable! i've only heard great feedbacks abt Copics and i've been dying to have them in my stash. although expensive, i would love to have a collection of these markers as well, i know it would be worth it! My scrapper buddy has them and I've slowly been convinced that I "need" them too! The blending is what attracts me. These things are all over the place right now- everyone is talking about them. So afraid to start as they will become my new drug of choice! I did just order a few journaling pens of theirs to try. I'm a new Copic "Cult Member" and I'm definitely hooked!! The colors are so brilliant & vibrant......now what do I do with all my "other pens"? yep, they are THAT great. i'm a new copic owner. i LOVE them. i enjoy coloring more now than i ever have!! they rock! I am new to copic markers. I have about a dozen and the blender pen. They are fab!!! I wish I had more time to color. I would love to take a class! EEK! Can I frantically wave my hands with you? I am dying to try these markers but can't justify the price. Thanks for the chance to win some! I've been wanting to get my hands on some, but they are simply NOT in my price range. Thanks for sharing, I hope I win! I don't have any Copics, but I have heard great things about them. I would love to win some to try! Ooh these look so fun! I'd love a chance to try! I tried them out at a craft show, but I don't own any. They are just too pricey for me. I hope I win giveaway! Thanks for the chance to win. Totally raising my hand on this one. I have tried them out at the craft store, but I am saving to get a whole set. They are truly awesome! Yay! Oh! I've been dying to try Copics! I use Tria lettrassets markers but everyone I know use Copics. I never had the chance to try them si that would be the perfect opportunity if I win them! Copics are amazing...I hope to own some soon. I've got a couple of them and love them! My only problem has been to find a good stamping ink that won't bleed when I use the markers (that and affording them!). I love copic markers. I used to color with prism watercolor pencils and my paper would warp and tear. I've had no problem with the copics! These are the best markers ever invented and I am always up for a few more. I love these things. I have only have 3 Copics, but I do like using them. Lately I've been coloring a lot with Prismacolor pencils, but I just found out the Copic colors to use for faces....those markers are definitely on my wish list! I HAVE MY HAND WAVING FRANTICALLY AS WELL! PICK ME, PICK ME. Want these pens so bad. Thanks for the chance to win!! Great cards you made!! I don't have any. But your cards are wonderfull! I love these markers and only recently broke down and bought a few. They are fabulous! I made Christmas gift tags & valentine cards with them. I have one marker and am eagerly awaiting the arrival of more. I have used these markers in a card class and now I want them all! They even say that you can store them any which way. I love the Copics that I have (4). I actually color the stamps and then stamp the image onto the paper. It works great! My Christmas cards came out great this year. I took a class and have 8 markers but would love the chance to expland my collection! I know it is also a skill that I need to practice with! i have a few of these! they are awesome and really do blend like a dream! would love to win some! great product, worth the money imo! oh YES. Copics are definitely on my wish list. They look fabulous. I don't have any (yet) - so I appreciate the chance to win some! I really love the great art you can make with Copics. No don't have any. I don't have Copics yet, but they sure are on my wish list. Would be a dream come true to win some. Thanks for the chance. I am totally intrigued by Copics.... I have a bunch of old prismacolor markers and they never quite lived up to their claims... Your samples are beautiful! I'm hoping I can swing some budget magic before Christmas and join the fun!! I do not have any nor have I ever seen them. I have head so many wonderful things about them and it is time I tried them! THEY ARE ON MY "WISH LIST" !! love copics but I'm not very good with them. They are worth the money and something that everyone should have in their supplies. I have a few and love how smoothly they color and glide on the cs. The only reason I haven't bought them yet, is the price. I'm a student, so I can't pay 5 euros on a pen (you don't want to have one, you must have at least a few to do something nice with them). So I would really really really want to win something! I have a small collection of Copics but I try to buy one every two weeks when HL has their 40% off coupon. I would be thrilled to add some more with your giveaway. wow...I just recently started to get into stamping...I would love a chance to try Copics out!!! I've only heard wonderful things about them!! I have been dying to try Copic markers but I can't find them where I live. Since they are a bit pricey, I have been hesitant to order them online and pay for shipping as I haven't been able to try them out first. Thanks for the review! I don't have any but would love a chance to play with some! I have been wanting to try these for sometime and hubby purchased me a few for Valentine's day and so far I really like the results. I would like some different colors tho. You know men and crafts like a bull in a china shop. I have used them and they are pricey! I feel like you need a lot of them to get a good blend. At least three in the same family and for that reason, I tend to stay away from them. Though if I had the $$$ I'd get me one of those huge sets! I have a few Copics and love using them. I would love to win more!! I dont have any at this time, but want to start to build my collection, I was just waiting on a good review of them. A friend got a set for valentines day and she loves them. And your artwork is gorgeous and just convinces me more that I need to start buying...thanks for the chance to win some!! I've been debating getting a few of these. I've seen quite a few tutorial and ideas just this week and I'm really wanting to pick some up. The price is what has stopped me from going out and picking up a few. Thanks for the chance to win. Just tried my hand at Copics last week - they are WONDERFUL! Would love to win some, thank you for the chance! I have a few Copic Markers and would love to learn more about them! I have heard nothing but raves from my friends about these markers. I haven't gotten to try any but they are definitely on my wish list for when I get some extra $$. Everyone says Copics are awesome. I have never used them, but they certainly are on my wish list. Your cards are delightful. Thanks for sharing. I am interested in trying out the Copic markers - everyone that uses them seems to love them! I have no doubt that they are a great investment (I do have some of the glitter pens made by Copic and love them! ), but don't really know where to start with the makers. Hmm...if you draw my name, it would probably help start up a new obsession for me. Thanks for offering this great opportunity! ~Tara D.
I have wanted some Copic markers for a long time now but the price has kept me from getting some. I hope I can win these that would be so awesome!!!!!!! I just recently got into Copics. Love them! I am also loving that Gumball Machine Stamp. So cute! I've been dying to try these markers, but I'm afraid they are like potato chips--when you start, you can't stop. My first Copics are on order. I'm hoping I will love them and it will get me more into colouring. These are definitely on my wish list. I've seen Jennifer Mcguire do some amazing work with them and would love to try them out. Thanks for the chance. Love the Happy Day card! yes - on my wish list ... I figure after my 3 kids get through college, if I am still making money I can justify buying them then .... only have to wait about 10 more years! I only have a few copics but I love them. They color so smoothly. I would love to add to my collection. I love your examples of how the lighter colors do not get overtaken by the darker shades and how completely they cover even small areas. I used some red and green for my Christmas cards and loved the depth of the colors as well. Thank you for your review. I was waiting to decide if I wanted to add to my 2pen start and now I most definitely will. I do have a very nice set of Copics and I think the qualify outweighs the price. They are really worth it! That describes me exactly - I would love to get my hands on some Copic markers and try them out to see what all the buzz is about! I have bought a few of the Copic Sketch markers and have tried a couple of them and like what I see so far. Thanks for sharing and for an opportunity to win. I have not tried copics yet, due to the price-they sound so amazing! Oh wow! I cannot tell you how I long I stared at these at Roberts crafts today! I kept going back but they only had a bundle package for $80.00! If they sold them individually I would have bought a couple but even with a coupon I just couldn't do it! I have been wanting these for a long time! Whoever gets picked is going to be so lucky!!!! I do have some copic markers and really like them. I have yet to use Copics, but would love to try!! I see so many great things created with them! I can't even begin to tell you how much I would love to start a collection of Copics! They keep getting bumped down my wish list because I know when I start, I won't stop! Every where I look people are raving about Copics! I am not a stamper - would these still be useful to me, or are they pretty much stamping markers? I doodle and journal with markers, would these be godo for that?? I love my Copics, it would be awesome to have a few more! these markers are super nice. my friend has these, but i don't want to use them, cause i know they are expensive. though she has done some cards with them and they came out gorgeous. i would love to get my scrappy hands on them. No I don't have any Copics yet but I have seen how people brag about them in the crafting world. They are definitely on my wish list. Unfortunately I can't afford them right now. Would love to win some and see what everyone else is raving about. God bless! I don't have any Copic markers yet, but they are definitely on my wish list. I've heard so much about them! I have never tried them, but would love to!!!! What an awesome give away, and a great review! Oooh oooh! Me Me Me! (Me frantically waving my hand) I'm sure I need these. I've had them on my wish list for months now!! I have been eyeing them for a year but have been afraid to to start. A little fear for the actual using and more for the amount of money I will spend to "get them all"
Yes, yes, and yes. Everything said about these markers is true! Love them! It's all about practice, practice, practice! or should that be play, play, play! I want to try these, but it seems like you have to invest a lot of $$$ to get enough colors to blend and make it worth it. I think if I start, it will be addicting =). I have a few Copic markers and LOVE the way they color. I havent expanded my collection too far because the price is a lot more than I want to pay for markers. thanks for a great giveaway. I would LOVE to own more of these. What an amazing giveaway!!! 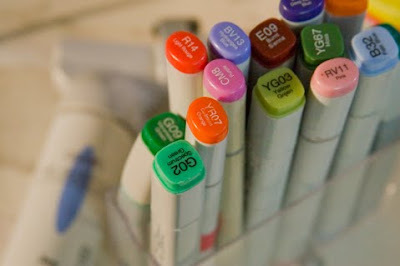 I have not been fortunate enough to try or buy these FABULOUS markers but I sure would LOVE to play with them!! Thanks for the chance to win this awesome prize & good luck to all of you. I've been trying very hard to keep my eyes closed when it comes to Copics...but oh, do I want to play with some of these beauties! I just know once I try them I will become addicted and want them ALL!!!! I only have a few markers in my collection and hardly use them because they don't really do a great job. After reading your review they sound like a great investment and perfect for those colouring jobs. I have a couple of Copics but I definately need more! They rock!!! None here, and they are on my wish list, just not in the budget right now. They are the best I've seen for that dementional look in shading. But alas, I too only have a few due to their price. Thanks for the chance! I would love to get some copic markers but right now...that won't happen ...no extra funds in the kitty for want to haves & how do you decide which ones you want or just have to buy first lol? well, i've never had a copic marker before but I have been starting to hear a lot about them. Yes I totally want a collection of them!! The problem is that I just don't want one, and I know that if I try them, I will have to get them, So I would love to recieve some for free first to try them out! Would love to try them. Thanks for the chance. I have been dying (different colors hee hee) and waiting quite a while to get my hands on a set of copic markers. They are on the expensive side but they are well worth the price. Everything I have seen using them looks amazing - no color lnes and everything blends - it looks professional. I cannot wait to get a set of my own. THanks for the chance to win! Thanks for the great review. I'd love to try them out!!! they are absolutely on my wish list... and what a great review! Your cards are very cute! The markers look interesting, can't wait to try them! I love these. i have been wanting to give them a try for quite some time. Your cards are very cute Ashley. I havent tried them. They look great but I wouldnt pay that price for them. A girl can never have enough! I'd love to try Copic markers. I think everything comes out beautiful with them. Thanks for a chance to win. I have not had to had to opportunity to use these tpes of markers yet but I hear some great things about them. I would love to own a set someday.. I do not own Copic markers (YET! ), but after reading your review, they are definitely on my Wish List now! I love to blend colors and typically use my CTMH blending pen. I'll have to run out today and look for them! Thanks for a great review and terrific card ideas, too! Thank you for your review! I have been so curious to find out all I can about them. I don't own any yet because I have been waiting to hear how those that own them, like them. It sounds like it's time to invest in a few of them. Thank you for the chance to win a set. How fun would that be?!? I just love the projects you msge with the Copic Markers. I have always wanted to give them a try. After reading this review I just may have to give them a try! I've used the Copic Ciao markers but not the others. I'd love to feel the square ones or the oval ones in my hand. GREAT colors and nice projects! I haven't bought any yet, mainly because I'm not good at drawing. But I have been gathering so many ideas and uses for these markers that I simply must get them. The price is a bit steep though, especially when you have no idea which colours should be your first few. My problem is that I want them all, so I just buy none. I have collected about 125 Copic markers so far. I love them! They are unequaled for coloring images, plus there are so many other uses for the markers (especially if you have the airbrush system too). Copics are delicious! I have about a dozen and would like every color! I have a few Copics! I would love to add to mine! Thanks for giving info on them! I have purchased a couple of copics, but I am not very good - you have done a wonderful job! Thank you for the opportunity to maybe increase my collection!! I don't have any yet!!! Tried some out at the LSS and loved them! I have a few and use them, but probably not as much as I should. I would love to have more, but the price and local availability really get in the way of that. I would love to own some of these and play with them! I saw someone at my lss using them w/the blender pen and was just in awe! So cool! I would love to have some Copic pens, I have a friend who swears by them, but the price has always scared me away from the purchase. Ashley, I agree with you 100%! I have only 18 markers, and building slowly to my collection because they are so expensive. BUT, they are worth it! They are definitely the BEST color medium I have ever used- clear, easy, wonderful! Thanks for the post and a chance to win more Copics! Love copic markers! Your cards are so pretty!! Thank you for the review. Copic markers are on my gotta have list!! These markers have been on my list for some time...I enjoy seeing the creative ways they are used but I haven't jumped in to purchase a set yet because I know once I own 2 they will multiply! No, I don't have any, but I neeeed them! What a great giveaway! I've been wanting to try these markers for a LONG time, but haven't yet. Thanks for chance to win! yes yes - oh i dream of coloring with the jewels of the Copic Markers - oh the vibrancy of life with Copic! I love what you did with the copics. Beautitul examples of what can be done. I only wish I had a set to work with and see for myself. Maybe someday?? Fingers crossed!! Thanks for the great review- I'd love to try them out myself! Happy National Craft Month!